McDonalds, Wal-Mart, Apple, Samsung, Honda, Nestle, KFC, Pizza Hut, Levis, Starbucks and Shell are successful businesses today, ones that are internationally recognized due to their global operations. All of these companies are involved in what is termed ‘International Business’ due to their transactions; sales, investments, logistics and transportation, taking place across two or more borders. Those looking to learn more about other countries and how business works with different cultures, would find Bachelor of international business degree very useful. These degree programs focus on various international business practices and regulations. To apply for any bachelor’s degree, students are required to have completed a minimum of a high school diploma or an equivalent GED qualification. It will be preferable if you have taken classes in accounting, business and economics in high school as they will make the transition to bachelors smoother and easier. Bachelor of international business degree can train you to work in a variety of business settings across the globe. This program teaches students how to analyze foreign trade and markets from a global perspective. Students learn to understand how the world economy works. Students are required to take courses related to international marketing and accounting, as well as international financial management. You will also get a chance to learn about international governance and how governance practices are different in some regions. In short, bachelor’s in international business will teach you what you’ll need to know about doing business internationally. Most students are also required to know one or more foreign languages by the time they graduate. You will be required to take some compulsory core courses that will be important toward the completion of the degree and you will also have the opportunity to take interdisciplinary elective courses to further specialize and broaden the scope of your degree. With a degree in international business, hard work and dedication, you can find employment opportunities around the world. It is expected that you have knowledge of managing international business operations. Hence there will be various career paths that you can possibly pursue. Human resource professionals are responsible for recruiting, screening, interviewing employees. Labor specialists also interpret and administer contract issues with employees such as pensions, wages and union issues. There are variety of jobs in human resources such as HR managers, HR specialists and HR assistants. The annual median pay of HR managers in 2012 was $99,720 while the expected job growth from 2012 to 2022 is 13%. Marketers get to work with a variety of people such as sales agents, financial staffers and sometimes art directors. Their versatility in the workplace can only be matched by their creativity. Their annual median wage in 2012 was $115,750 while the expected job growth from 2012 to 2022 at 12%. Logistics Managers are responsible for handling a company’s supply chain, with a focus on international business; you can coordinate international supply chains for multinational companies. Their annual median wage in 2012 was $72,780 while the expected job growth from 2012 to 2022 is 22%. Admin managers coordinate, direct and plan all the supportive services of an organization. Their annual median pay in 2012 was $81,080 while the expected job growth from 2012 to 2022 is 12%. If you think that you are interested in business and working with people from all over the world, then a degree in international business can be a great option for you. Q:How much can I earn with a Bachelor in International Business? A:With a Bachelor in International Business you can earn 40,000 to 60,000 US dollars annually. 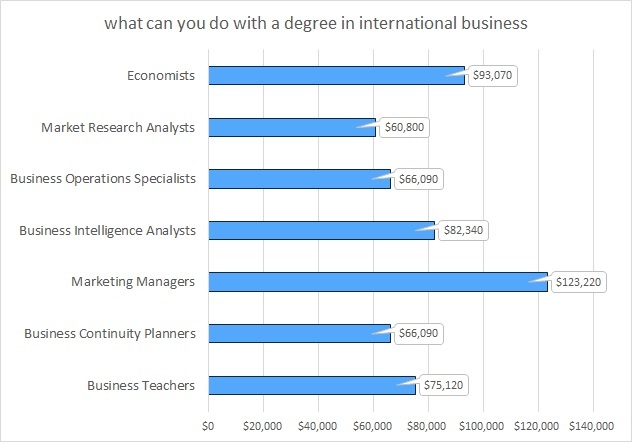 Q:How much can one earn with an International Business Bachelor degree? A:You can earn between 40,000 to 60,000 US dollars with an International business bachelor. Q:What are the opportunities to transfer credits to another university in an International Business bachelors program? A:The International Business bachelors degree program enjoys more flexibility in transfer options from one university to another than any other program. This is mainly because a more global market place is discussed in the International Business degree program. Students from across the Atlantic also transfer their credit hours to universities in the U.S. with this program. Q:Is it possible to complete the bachelor international business degree within 2 years? A:the Bachelor International Business degree programs span up to four years, however, students who wish to complete these degrees sooner, can opt fot the accelerated degree programs. Also, the universities listed on our website enable students pursue the online degrees in this field, which can be completed at students' desired pace. Q:What are the names of some of the institutions offering a qualification in Bachelor of International Business New York? A:Institutions offering the Bachelor of International Business in New York are Berkley College, Long Island University, Ellis College, Hofstra University, Frank G. Zarb School of Business, Pace University Lubin School of Business, and D'youville College in Buffalo, New York. For a comprehensive list of online institutions offering this qualification, students are advised to search our website. Q:Can you name a few core courses I will cover in a bachelors degree in international business? A:Bachelor degree programs in international business will help students learn about the international marketing environment. A few of the core subjects covered in this field include the following: accounting, principles of marketing, global issues, business and society, government policies, international economics, statistics, and micro economics. The program can be completed in four years. Q:How long is the bachelors in international business? A:A bachelor's degree in international business generally takes four years to complete. However, the duration may vary depending on the institute offering the program. Online programs offered in international business can also vary in duration, as they are self paced and students are given the opportunity to learn at their own pace. Q:What are some of the admissions requirements for Bachelors in International Business? A:To apply for bachelors in international business, applicants need to have a high school diploma or GED. In addition, you will be required to provide all relevant transcripts, the completed application form, SAT scores, and a personal statement essay explaining why you want to pursue this degree. In some cases, depending on individual circumstances or the particular university's requirements, candidates may also be asked to appear for an interview.